Rhinoplasty is a surgical procedure designed for those wishing to refine and reshape their nose. Often referred to as a “nose job” or a “nose reshaping” by many patients, people choose rhinoplasty for a variety of reasons. It can correct cosmetic problems, like a bump or a hook as well as structural problems, like difficulty breathing due to a deviated septum. The septum, a wall of cartilage between your two nostrils, divides the nasal cavity in half. An ideal septum is centered in the nose and creates an even passageway on both the left and right side. A deviated septum, which occurs when the septum shifts away from the midline, can cause cosmetic problems as well as issues with breathing. Rhinoplasty can help correct this, as well as many different types of cosmetic abnormalities. If you struggle with chronic congestion or breathing freely, or you’ve ever wished that your nose was smaller or straighter, you could be a great candidate for rhinoplasty. Recovery after a nose job is usually minimal. Common side effects include swelling and bruising, which will subside over time. You can typically return to work and daily activities as soon as you wish. As with the majority of cosmetic procedures, it is best to avoid strenuous activities for a few weeks after your surgery. For optimal results, it is also advisable that you stay out of the sun for up to eight weeks. For many people, a nose job can be a life-changing procedure. Your nose is a prominent facial feature, and refining and reshaping it can help improve the overall appearance of your face. Many patients report increased confidence, improved self-esteem, and easier breathing after their Rhinoplasty. To find out if it’s right for you, get in touch with us today! As with all plastic surgery, a nose job is a very individualized procedure, so the extent of the surgery will depend on your specific goals. Therefore, the cost of nose job will reflect that. Before having a nose job, Dr. Jeffrey Marvel will discuss your expectations and concerns in addition to your medical history. 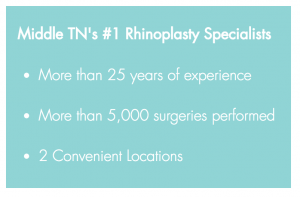 Please call 615-329-3900 or contact us today for more information, or to schedule a consultation.